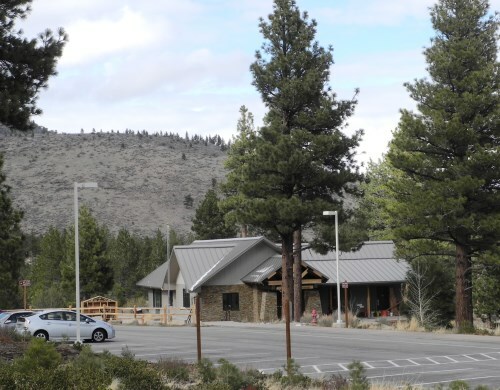 Galena Creek Visitor Center and Recreation Area is a partnership between the U.S. Forest Service (Humboldt-Toiyabe National Forest), Washoe County Regional Parks and Open Space and the Great Basin Institute. The Visitor Center is operated by the Great Basin Institute, which provides staff, volunteers, A variety of educational and nature programs for children and families are provided throughout the year by the Great Basin Institute. There are technically three different facilities - Galena Creek Visitor Center, Galena Creek Recreation Area, and Galena Creek Regional Park. For practical purposes, visitors will find that there really isn't much distinction between these when it comes to enjoying recreation in the Galena Creek area. Each month of the year brings new things to do at Galena Creek Visitor Center for both kids and adults. Summers activities include guided hikes, ranger programs, evening campfire programs, programs for young children, fishing at Marilyn's Pond, and summer camps (there are also spring and fall break camps). Winter programs explore the snowy landscape around the Galena Creek Recreation Area. Visit the Galena Creek events calendar to see what's going on and when. Take a hike - Several hiking trails can be accessed from Galena Creek Recreation Area. In addition to a paved, half-mile interpretive trail next to the Galena Creek Visitor Center, there is the Jones-Whites Creek Loop Trail, Bitterbrush Trail, Upper Thomas Creek Trail, Dry Pond Trail, Upper Whites Creek Trail, the Mt. Rose Wilderness Area, and more. Get more details from "Hiking Trails of the Galena Creek Recreation Area." Enjoy fall and winter - Fall is a great time at Galena Creek Visitor Center. The trees display beautiful fall color and the air is cool, making for pleasant hiking conditions. When there is snow, the trails turn into snowshoeing and cross-country skiing routes. You can take guided snowshoe walks or explore the area on your own. Galena Fest - This annual fall event (September) is a family affair with numerous activities, including the area's toughest mountain bike challenge (The Bloody Rose), a challenging trail run (The Wicked Thorn), Kids' Run and trail walk. On the just-for-fun side are a music festival, beer garden, food and information vendors, Kids Expo and Art-in-the-Park events. Summer season is May 1 through October 14. Hours are 9 a.m. to 5 p.m., Tuesday through Sunday. Winter season is October 15 through April 30. Hours are 9 a.m. to 4 p.m., Friday through Sunday. The rest of Galena Creek Regional Park is open year around for day use. For more information, call the ranger office at (775) 849-2511. Galena Creek Visitor Center is at 18250 Mt. Rose Highway (Nevada 431). The Center and parking area are just inside the north entrance to Galena Creek Recreation Area. A short distance further south is the entrance to Galena Creek Regional Park. From Reno, either go south on S. Virginia Street to the Mt. Rose Highway and turn right (at The Summit Shopping Center), or take U.S. 395 south to the Mt. Rose Highway exit and go right. Just after you get into the trees, looks for signs and a right turn into the Galena Creek Visitor Center parking area. For more information, call (775) 849-4948.